Although most of us don’t think about it, grout plays an important role in our daily lives. Grout is the material placed between tiles on the floor, in a shower or a kitchen backsplash, or anywhere else tile is installed. Grout is instrumental in holding the tiles that make up our homes in their proper place, keeping them stable and preventing cracking and chipping. Grout also prevents water, dust, dirt and grime from getting underneath the tiles, keeping them from dislodging or developing mold and mildew.. 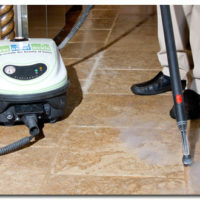 Properly installed grout does its job well, but in the process, the grout itself becomes dirty, discolored and damaged. When it does, it’s important to set to work cleaning grout lines and the surrounding tiles. Otherwise, your bathroom or kitchen suffers from unsightly dirty grout and a potentially unhealthy environment. The Grout Medic can clean your grout to make it look fresh and new again. Grout is a type of cement that is placed in the joints between tiles to set and keep them in place. It comes in two types — unsanded, which is used for normally spaced tiles, and sanded, which is placed between tiles with a gap of more than one-quarter inch. The sand bulks up the grout to keep the joints from shrinking and making the tiles pull together. During tile grouting or tile regrouting, an installer spreads the grout into the joints, lightly pressing it into the cracks, before smoothing it and cleaning grout that got smeared on the surrounding tiles. It takes a couple of days for the grout to cure, or dry into place. This is when most installers recommend grout sealing to protect the grout into the future. All types of grout are porous, meaning its surface is filled with microscopic holes. Each of these holes captures water, dust, dirt and hair. Any material that falls on the floor in a bathroom or kitchen can end up embedded in the grout. As a result, grout gets dirty, discolored and gross. In the case of kitchens and bathrooms — the rooms where grout is most commonly used — dirty grout presents a health hazard, especially for children and pets who are often face-to-face with dirty floors. Its porous nature makes cleaning grout very difficult with normal household chemicals and elbow grease. As you attempt to mop or wash the floor, though you are picking up the surface dirt, you’re not able to clear the grout’s pores and, in fact, you’re making the grout even dirtier. The Grout Medic uses a vapor technology to free dirt, grime, mold and mildew from your grout, clearing it away and leaving a clean, chemical-free surface for you and your family. After cleaning grout, or an entire tile regrouting procedure, grout specialists will recommend grout sealing to complete the project. 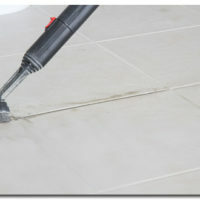 Grout sealing is the process of applying a clear penetrating material to the grout. The sealant fills in the grout’s pores so that water and dirt cannot enter. Not only does this make the grout look cleaner and fresher for a longer period of time, grout sealing makes cleaning your grout much easier. You are no longer trying to scrub porous grout, but are just wiping the surface of the seal. If you’re interested in The Grout Medic’s specialized vapor method for cleaning grout, or our tile regrouting, grout sealing, recaulking and water damage repair services, contact your nearest The Grout Medic location today for a free estimate.